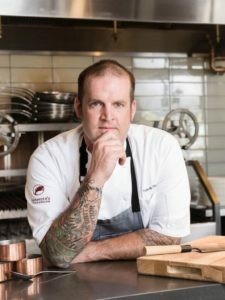 With more than 25 years of experience managing kitchens from Michelin-starred fine-dining establishments to Venetian osterias to modern California restaurants, Chef Travis Flood found a new home at Alexander’s Steakhouse, Pasadena’s most notable fine dining restaurant with a Japanese bent, in early 2018. Born and raised in San Diego, Flood was influenced by the classic cooking TV shows of the late 8O’s and early 9O’s and began working his way up through the kitchen echelon at age 15. He started his formal training at the California Culinary Academy in San Francisco, where he graduated with honors. In 2001, Flood secured a position at San Francisco’s Fifth Floor, a well-known launch pad for aspiring chefs, where he worked under legendary Chef Laurent Gras, a mentor to Flood, for three years. He discovered his own voice in professional kitchens, transitioned to working as a private chef, and at the age of 26, landed at the iconic Moose’s Restaurant in San Francisco’s famed North Beach neighborhood, where he worked closely with farm fresh produce and local artisans. Before returning to Southern California, he also worked at Postrio, Ame, and L2O in Chicago, prior to landing at La Jolla’s George’s at the Cove as chef de cuisine. Now at Alexander’s Steakhouse, Flood blends his mastery of both classic and modern elements to provide guests with an experience that’s both familiar and unique. Alexander’s serves the finest high-end ingredients available, which aligns with Flood’s advocacy of sustainable and seasonal ingredients. When he’s not in the kitchen, Flood spends time with his wife and twin daughters and cycling through the San Gabriel Mountains. He is also dedicated to helping end child hunger as an ambassador for No Kid Hungry and Chefs Cycle.